We start the morning in Diabat. Follow the river through forests, wild vegetation, hills and dunes.We will meet sheep, camel and donkey herds. After arriving Ghazoua we come to Sidi Hmad Mhand. We sta at night in a camp under argan trees. In the evening we visit a argan oil cooperative and look at how the precious oil is extracted. After breakfast in Sidi Hmad we continue our tour through the biggest Argan forests in the world. We follow the river and arrive Iftane. In the afternoon we watch the sunset and go with the horses into the sea. 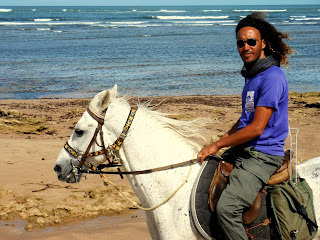 We ride along the ocean of Sidi Mbark, there we have a picnic next to waterfalls and swim with the horses. 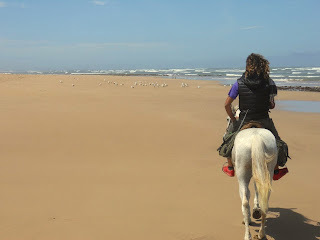 In the afternoon we will ride along beautiful beaches, trot and gallop. 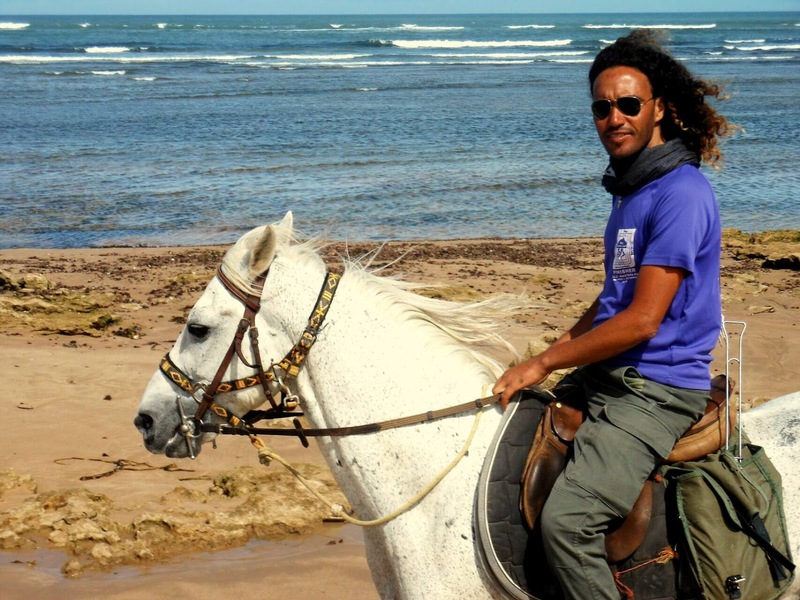 Our camp is on the beach of Sidi Kaouki. On this beach we have the best opportunity for galloping. In a fishing village we see fishermen at work. The biggest dunes with the fine sand is in this area and called "little sahara". In the afternoon we return to Diabat. 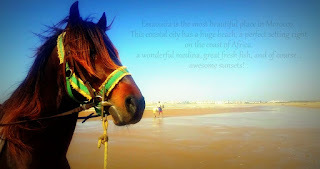 The fishing village located 25 km from Essaouira. We start at 10am, picnic in the dunes at the beach. We stay the night in a bivouac tent at the beach. You can thus stay in a hotel or Riad if you want. We start in Diabat in the morning. We follow the river through forests, wild vegetation, hills and dunes. 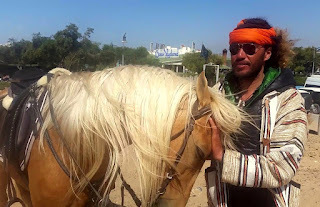 We will meet sheep, camel and donkey herds. Even tortoises live here. We visit Ghazoua and in the evening we will arrive Sidi Hmad Mhand. we take a look in a argan oil cooperative and observe how the precious oil is Extracted. 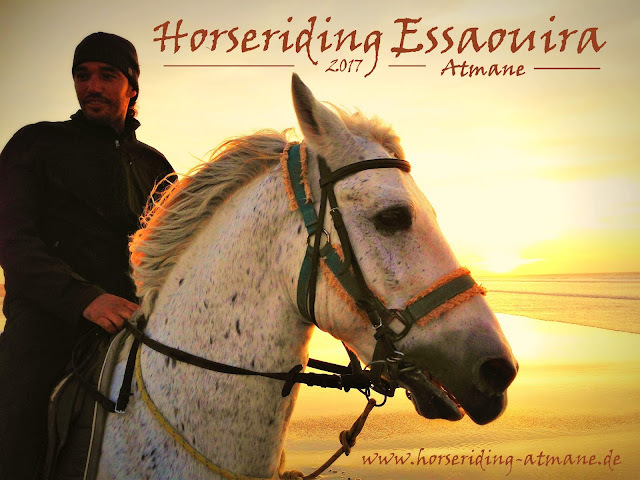 We leave Sidi Hmad Mhand after breakfast and ride through the biggest Argan forests of the world to Sidi Kaouki, a beautiful village on the beach. Stay at night in guesthouse. 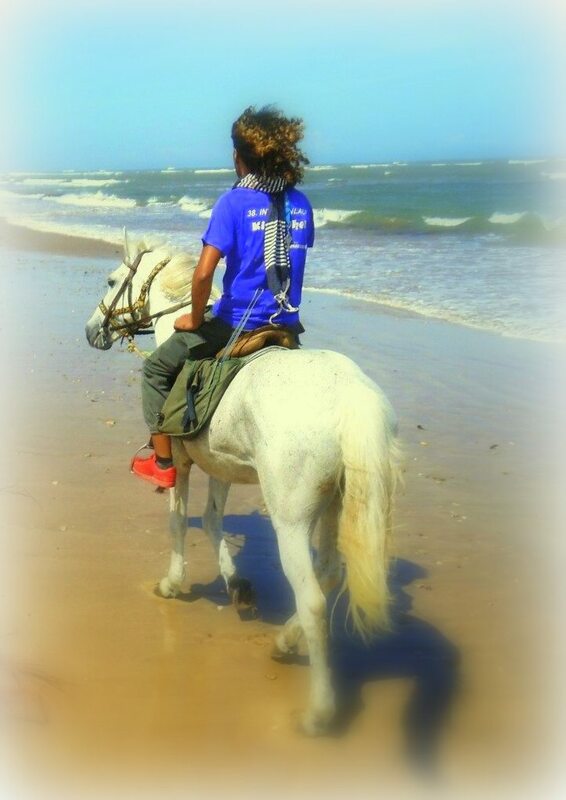 Today we have the opportunity for galloping on a endless beach. In a fishing village we see fishermen at work. In this area there are the biggest dunes with the fine sand, It Seems here like the desert and is called "the little sahara". In the evening we return to Diabat. 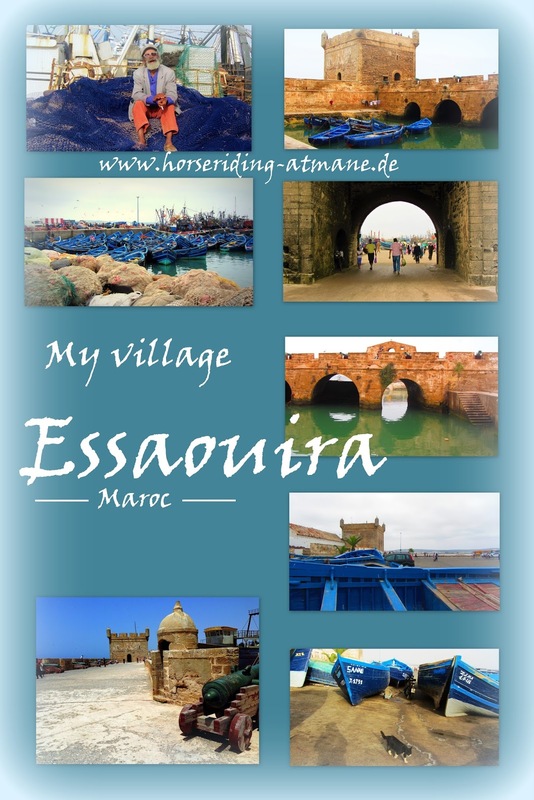 The fishing village located 25 km from Essaouira. We start at 10am, picnic in the dunes at the beach. We stay the night in a bivouac tent at the beach. 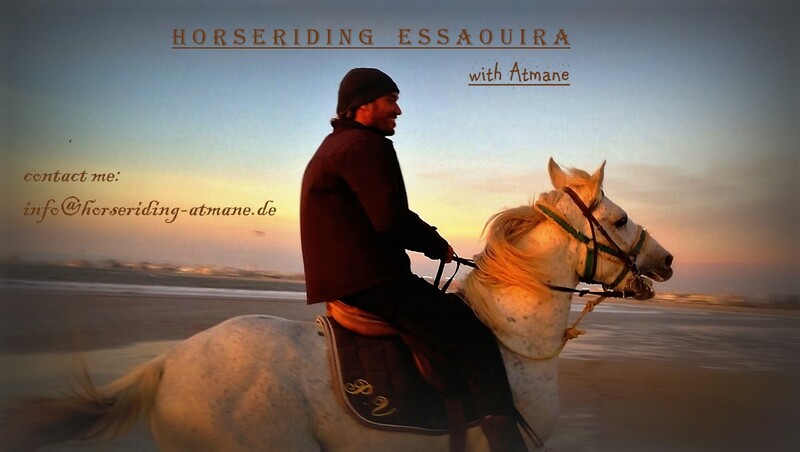 Me, Atmane, and my two companions, Silver and Bambino, welcome you to our paradise. Essaouira is a true paradise for horseriding! 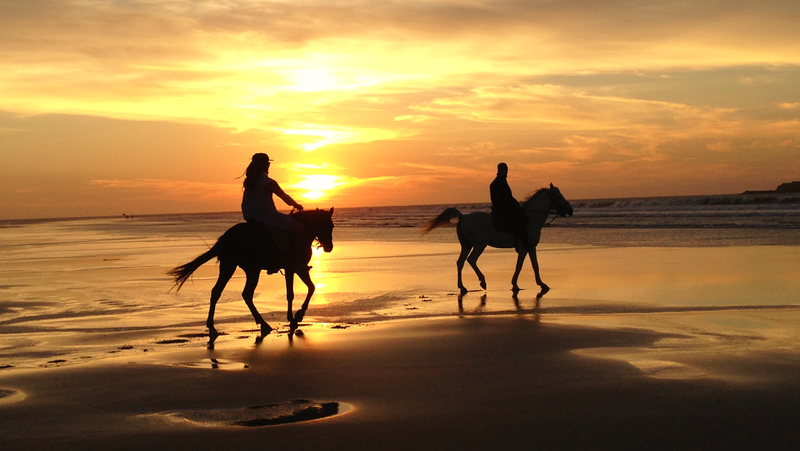 Adults and even children dream of galloping once in a lifetime along the beach. Here you can fulfill your dream. The wind in the hair and the endless sand beach is pure freedom! We have the best climatic conditions all year round. In the summer a constant fresh wind blows and makes the riding pleasant, in winter the temperatures rarely drop below 15 ° C.
I offer you a very varied program, guided rides, individual lessons, half - or fullday tours, weekend rides with overnight accommodation in the camp, as well as all - inclusive offers (accommodation and riding). 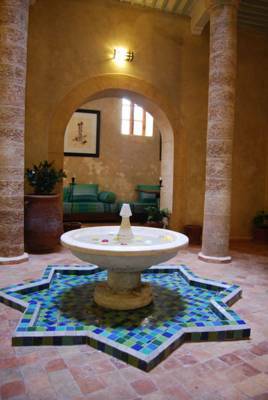 My Partner - Hotel Riad "Rose des vents" is located in the romantic Medina of Essaouira, but away from the tourist center. It is a good starting point and I personally pickyou up if you want. The rooms can be booked together with my program. and also if you like we do photo shooting together to an awesome sundown!